Can I borrow him? Next year? I married into an Italian family, but most of the time they're more about the quantity than the quality. Disappointing. Remind me to come visit in January! There is something very satisfying about having stores of good food stocked away. Ooohh! I think I'll have spaghetti for dinner, though I don't think it will be as good as yours. That looks so delicious! I'm practically drooling over here. Our husbands are Nonna's separated at birth. I'd love to do some canning, but I'm very afraid of poisoning my family! OOOOO....send him to my house..please? I have already bought the wine, and I will bring some nice stinky cheese. The photos are AWESOME! Can I fly over to your house now to smell 'it'?!!!! you are so sending that to me in the jungle. promise me this. um can I move in? I'll take him and some sauce please! That looks soooo good, all the fresh veggies. Inspiring - pasta it is tonight. Oh Yum. All full of vitamins, too! Very, very envious. Can I come visit in January? BTW, my Magpie feed was broken for who knows how long. Maybe since you bought your own domain name? They look great (maybe I should try to overcome my wholly irrational fears about canning stuff). 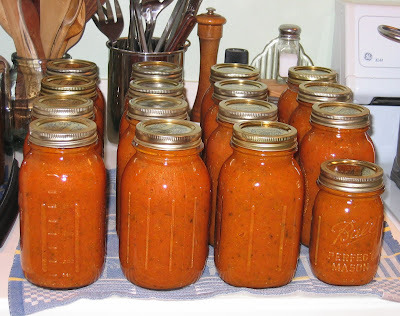 I have never canned tomato sauce and I should--we use it so much. But I did make and can tomato/basil jam last month w/my own tomatoes and basil. It's amazing how many tomatoes you have to chop to get 3 1/2 cups worth! Yeah. I have tomato envy.